A little while back, we published Rob Kelly’s REEL RETRO CINEMA column on 1981’s Condorman, a superhero movie that really wasn’t. (Click here.) It reminded me of another superhero movie that wasn’t, from the same era – 1980’s Hero at Large. I never saw Hero at Large in the theater but it was in heavy rotation on HBO at just the right time and, given the adolescent I was, I fell in love with it. It always struck me as a sort of Bizarro Universe version of Superman: The Movie – the Captain Avengermania seen in the film appeared to be inspired by the popularity of Richard Donner’s flick, and the two had similar atmospheres, since each was filmed in the gritty, exciting New York City of the period. Superheroes in live action were a real thing in the mid-to-late 1970s, reaching their peak (in more ways than one) with 1978’s Superman. Doc Savage, Spider-Man, Wonder Woman, Captain America, the Incredible Hulk, Dr. Strange, and even original creations like the Greatest American Hero donned tights and fought for truth and justice on the big and small screens. 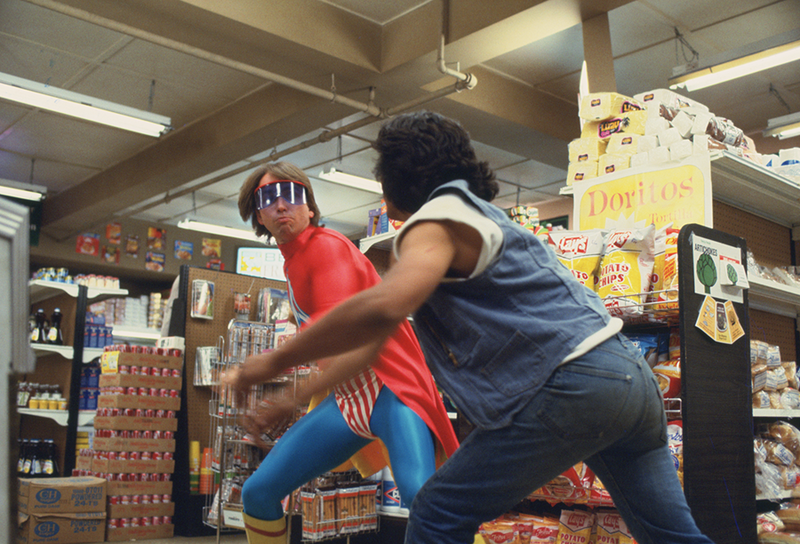 Coming on the tail end of this trend was 1980’s Hero at Large, starring sitcom megastar John Ritter as Steve Nichols, a struggling actor living in New York City, who finds himself a hero to many in his role of the costumed superhero Captain Avenger. Steve is a nice guy; maybe too nice to survive in the cutthroat world that was (is?) the New York City acting scene. Early in the film Steve has lunch with his grizzled old agent (veteran character actor Allan Rich), who is aghast when he learns that Steve gave away a part in a commercial to a fellow actor friend. Steve believes, truly, that one day his friend will return the favor, and generally seems to have a sunny, optimistic view of the world, despite the fact that he can’t even pay his rent because he can’t find acting gigs. At this same time, a big budget movie called Captain Avenger is being released, and the studio has hired dozens of able-bodied leading-man types to dress as the titular hero and make personal appearances at local theaters. Steve dons the garishly colored, striped spandex outfit and does his best, even though a lot of jaded New Yorkers mock him. Then, while stopping off at a local market on his way home, Steve finds himself in the middle of a stick-up. Still dressed as Captain Avenger, Steve shows unbelievable courage by beating up the two hoods and tossing them onto the streets. After accepting the grateful thanks of the shop owners, Steve pays for his milk, and leaves. The next day, however, news of the event has spread, and people want to know, who is this Captain Avenger guy? He befriends his neighbor from across the hall, a set designer named Jolene (Anne Archer). He really likes her, but she keeps Steve at a distance. Later, after Steve — excuse me, Captain Avenger — gets involved in a car chase with some crooks and is shot in the process, he wanders home and Jolene takes care of him, dressing his wound and finding herself impressed with his bravery. At the same time, a PR agency, led by the oily Walter Reeves (Bert Convy), has been hired to boost the re-election campaign for the city’s mayor (Leonard Harris, who also played a politician in his sole other film credit, Taxi Driver). Reeves sees how much people like and look up to Captain Avenger, so he hires Steve to play the part across the city, as a promotional tool for the mayor. Steve takes the gig, since it plays into his ego and his need to perform. Unfortunately, things get out of hand when Captain Avenger finds himself “foiling” an armed robbery on a subway train, which turns out to be a staged event. Steve feels dirty for deceiving the good people of New York City, and threatens to quit altogether. He makes one final appearance as Captain Avenger at a campaign rally for the mayor, and tries to tell the adoring crowd that it’s not he who matters, it’s what he does, and that anyone can be a hero if they want to be. Unfortunately, a reporter who has been tracking the Captain Avenger story chooses this moment to reveal to everyone that the subway rescue was staged, and maybe this whole thing is one big lie. The crowd quickly turns into a mob, fights break out, and Steve himself is attacked, but manages to escape. But the Captain Avenger name is now disgraced. Jolene consoles Steve, but he still feels awful. Then, on his way home, he sees a fire has broken out at a nearby apartment building, and he risks his life by heading into the building and saving the life of some trapped children. The crowd loves him, Steve’s point about heroism is made, and he and Jolene head home. The end. Hero at Large is an unusual mix. Rated PG and running less than 90 minutes, the film is clearly aimed at a family audience. Not little kids, exactly (Ritter’s hit show, Three’s Company, was full of sexual innuendo and decidedly not considered family viewing), but it’s a generally warm-hearted, genial story that recalls the work of veteran film director Frank Capra, whose 1941 movie, Meet John Doe, is basically this same story but without the costumed superhero. Everyone in this version of New York is pretty friendly; they quickly embrace the idea of a guy dressed in tights running around doing good deeds. Even Steve’s landlord, a former actress and professional eccentric, doesn’t really seem all that bothered that Steve is always behind on his rent. That said, Hero at Large has a generally dark, gritty look to it, and there are enough references (visually and otherwise) to the aforementioned Taxi Driver (definitely not family viewing!) that it feels like it wants to say something bigger, deeper, and maybe darker about people’s need for a hero, and the concomitant need to bring that hero down. The scene at the rally, where the crowd becomes a mob, has a violent energy to it that seems at odds with the rest of the film, but director Martin Davidson (The Lords of Flatbush) cuts away before things get too scary. The guys at the PR firm are sleazy, of course, but none of them seem all that bad, just sort of TV-level bad, the kinds of guys who could be taught the error of their ways after a good talking to. My biggest issue with the last film I covered in REEL RETRO CINEMA, Disney’s Condorman (click here), was that there wasn’t enough superhero derring-do in it. Hero at Large is a little better in that regard — we have a few scenes of CA in action, and the first one in the market is well staged and high energy, if very brief. When Steve gets shot, it’s a genuine shock, because you’re not expecting the film to get to that level of violence, at least so soon. After all, Steve really doesn’t know what he’s doing; he’s just an actor (albeit one in good shape) in a silly costume. Unfortunately, the filmmakers clearly wanted to concentrate on the love story, and the second half of the film is heavily focused on Ritter and Archer’s budding romance. They are fine together (Archer auditioned for the role of Lois Lane in Superman, so she might have seen this part as a consolation prize), but this angle, in the end, isn’t all that compelling, and even though the movie is pretty short, I found my attention wandering a bit during these scenes. The whole “anyone can be a hero” angle is evergreen (it’s basically the theme to last year’s transcendent Spider-Man: Into The Spider-Verse, also set in NYC), and I wish the film had given more time to exploring it. Steve’s third-act redemption is almost instantaneous after his fall, and over much too soon. Somehow, I missed Hero at Large during my days as a kid watching cable movie channels until my eyes fell out, where the film developed a little bit of a cult following. So, I didn’t come to it with any sort of nostalgia, and see the movie for what it is: an interesting curio, an attempt at a variation on a genre that quickly fell into formula. Too sophisticated for kids but not really deep enough for adults, it’s probably perfect viewing for young kids who love superheroes and are ready to handle some of the thorny issues that come with putting on a costume and risking your life to save others. One final note: I am surprised that Hero at Large never had any sort of comic-book medium tie-in. Between Marvel, DC, Charlton and Whitman (nee Gold Key), at the time virtually every film or TV property with even the slightest hint of fantasy or kid appeal was snapped up and turned into a comic book. I totally could see a Marvel Hero at Large comic book, done by, let’s say, Bill Mantlo and Sal Buscema maybe, about the further adventures of Captain Avenger as he fights to make the streets of New York safe. Surely it wouldn’t have taken long until Spider-Man or the Hulk showed up, right? Rob Kelly is a writer/artist/comics and film historian. He is the host or co-host of several shows on The Fire and Water Podcast Network, including Aquaman and Firestorm: The Fire and Water Podcast, The Film and Water Podcast, TreasuryCast, Superman Movie Minute, MASHCast and Pod Dylan. Thanks, Rob! Chris and Matt covered this a couple weeks ago on their Time Shifters podcast: http://www.timeshifterspodcast.com/hero-at-large-1980/#sthash.5xcaaLyu.dpbs. Although it’s been many years, I love this movie and need to unwrap my DVD to watch it again since it has somehow entered the conversation lately. Great article Rob! This movie was a staple on our local syndicated station in the mid 80s. I loved it every time. I was just thinking of it yesterday! Weird! Off to listen to Timeshifters!